Halifax’s trendiest shopping is focused on Spring Garden Road and the nearby streets and lanes. It’s the perfect place to look for unique souvenirs in the many boutiques or grab a bite to eat after visiting nearby attractions. There are some chain stores but the area’s reputation rests on its high-quality independent shops. 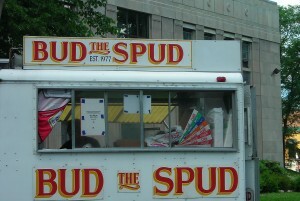 Keep an eye out for the Bud the Spud chip truck, parked near the library on Spring Garden Road during the summer months. Their hand-cut fries, made from Prince Edward Island potatoes, are legendary among Haligonians. Good restaurants to try on Spring Garden Road include the Italian eatery Il Mercato (although it tends towards the expensive side) and My Father’s Moustache, known for its steaks and seafood. Spring Garden Road and the surrounding area is busy all day but it really comes alive at night. Many bars and pubs are packed and it’s a good place to check out live music.